My interest in consciousness, awareness, cognition, and empathy with those before my incarnation, tends to stem from watching documentary films(some 40 years ago) of times before my birth, which induced a deep-down feeling that I’d “never not been here”… that I’d always been a part of the life/energy/consciousness equation. I also embrace the things that he was at pains to point us towards. However… I have grave misgivings about what he would make of much of modern-day ‘religion’! Unfortunately(in my view), many of the interpretations, activities, and indoctrination practised by many organised, institutional ‘religions’/’denominations’, bear little or no resemblance to what he was really driving at! I have a great problem(having read a great many opinions regarding flood-victims vs Syrian refugees), with many people’s attitudes towards helping others in crisis!!! 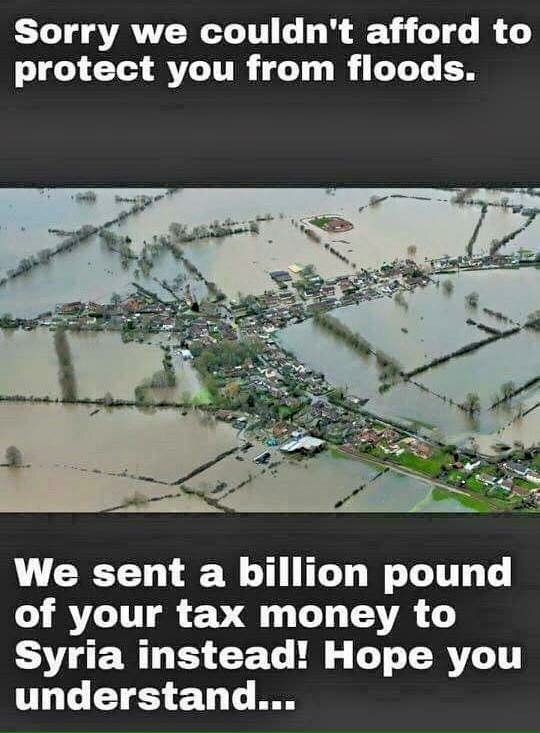 Which way of dispensing aid to unfortunate groups of people, is the ‘right’ one!?? If the “charity begins at home” approach is the right one, then the caption in this photo would hold good. But.. if we really believe that humankind is one family, and that race, creed, colour etc. shouldn’t be a dividing or a deciding factor; then, in my view, the aid resources that we offer to unfortunate groups, should be either spread more thinly amongst ALL the needy, or.. we should exercise priorities of ‘greatest need’, rather than those of race/colour/creed, or(same thing basically) the “us and them” criterion that the post appears to be suggesting. Is Vision an Input or an Output situation? Or… BOTH?? Apparently, the act of looking, affects anything that we look at; which might explain the fact that we can often feel someone looking at us without seeing them? However.. we also believe that the act of seeing, is one of ‘input’ of light-energy reflected from the source of of the object which we ‘see’, and… that the image of that object is formed on the internal surface of the eye, and interpreted by the brain, and, as such, is an ‘internal’ image which has entered from an apparent external source.